ACF’s poker-room consists of 20 tables or more, open 24/7 ; its dealers, floor-manager and employees are all very professional and totally poker-dedicated. 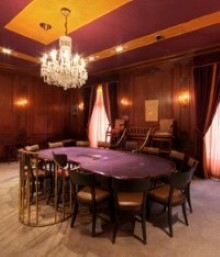 Since it's opening, more than fifteen years ago, the poker-room has hosted the biggest cash-games in the world. The poker-room has a broad variety of cash-game tables, starting with 50€ buy-in, mostly in Texas Hold’Em. Other poker games can be played as well : Omaha, Omaha Hi-Lo, mixed-games, etc. Since 2010, a private room has been created, in an even more prestigious and quiet room of the ACF. It is dedicated to the higher limits, and all players are welcomed personally by the employees who do all their best to fulfill any requests. Morning Tournaments: Every morning (even on Saturdays and Sundays) at 10:30am we offer a € 50 No Limit Hold’Em Tournament. - Mondays, Thursdays and Fridays at 2.30: No Limit Hold’Em € 50 Freezeout.